Clarification! 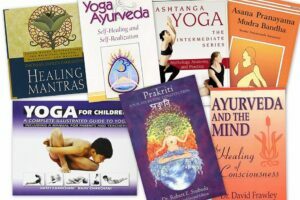 All Posture Based Yoga Practice Is Hatha Yoga? How Yoga helps in Diabetes? The upper back and shoulders tend to be the most ‘dead’ part of the body. Sitting for long hours, poor posture, and too much stress have a way of rounding the shoulders, collapsing the chest, and making the neck become tight and painful. We very rarely (outside of specific practices like yoga, dance, or gymnastics), do anything in our daily lives to open up this part of our body, and over years it becomes rigid. Why is it useful to have an open upper body? We keep talking about posture and alignment, but that’s because even though it should be simple, people seem to resist making corrections until the problem becomes unbearable. So in the spirit of prevention before cure, opening up the chest and shoulders can help to maintain good alignment, and reduce some of the unnecessary tension which inevitably leads to long term pain. Many people suffer with chronic back, neck and shoulder pain for years, feeling like it is just a part of life, not realising that with just a few simple exercises they can begin to relieve many of these problems. After a short while of persistent practice it’s possible to undo years of bad habits. Tight or collapsed chest also tends to make it difficult to create enough space to fill the lungs properly. Working on the upper back loosens the muscles around the ribs, and helps to be able to take deeper longer breaths. This in turn starts to calm the mind. People tend to store emotions in their chest, so stretching and opening this area is particularly good for releasing sadness, grief, and fear. The more you expand your sternum, and release your upper body, the more blood, and oxygen can circulate leaving you feeling mentally and physically invigorated. Here are some simple stretches to help you open the upper body. Initially stay in the postures for about 30 seconds, gradually increasing the time to 3 minutes. Put your hands on the wall, as high up as possible keeping the arms parallel. Lean into the wall and slide the palms down, arching your back. Work on bringing the chin and chest as close to the wall as possible. Place your hands on the wall at waist height, keeping your arms parallel. Keeping your feet hip width apart, walk back until your torso arms and hips form a straight line. Press your palms in to the wall trying to straighten them, and work on bringing your chest down towards the ground. Slightly tilt your hips forward, and start to arch your back. Bend your elbows and place them on the edge of a table or surface about waist height. Walk back until your body becomes parallel to the floor. 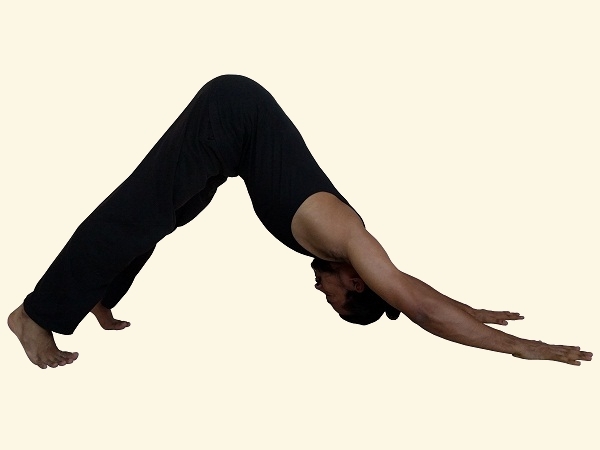 Open your chest towards the floor and arch your back. You can try this same stretch holding a book or block between your palms which will rotate the scapula outside creating more space in the upper back region. You can also get someone to add weight onto your back to intensify the stretch. Join your palms together and place them on a table or surface that is about waist height, walk back until your torso is parallel to the floor. Straighten your arms and press them down on the table. Work on bringing your chest towards the floor while arching the back. Come onto your hands and knees on the floor (table top position). Bend your elbows and bring the chest on the floor (the distance of chest from the knees depends on your flexibility). From here, slowly straighten your arms, making sure to keep them shoulder width apart with the palms facing down. This posture is similar to Downward facing dog except the distance between your hands and feet is a bit wider, and your heels are lifted. Bring the crown of the head towards or onto the floor underneath the shoulders. 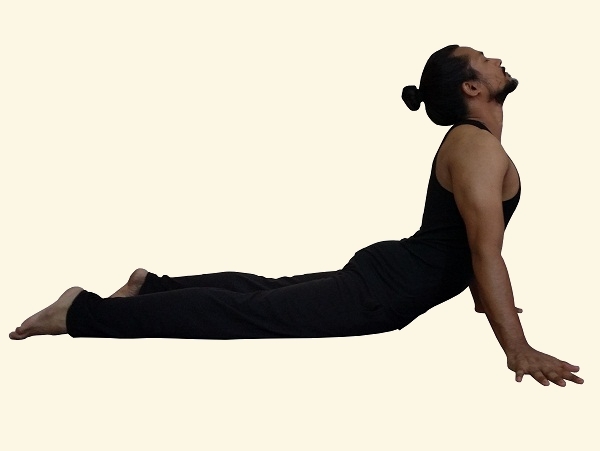 Ordinary Bhujangasana is also useful for working on the upper back but this variation is specifically to help with opening the chest and shoulders. Straighten the arms lifting the chest up off the floor, try to bring the sternum forward. For each of the poses above you will feel the stretch in slightly different areas of your body, (depending on where the tightness is in your body). These postures should allow you to work on the resistance in your triceps, shoulders, latissimus dorsi, upper back, and scapula. 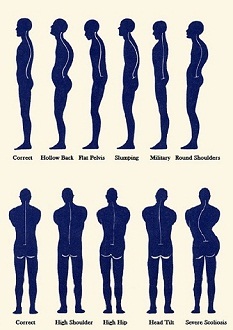 You can modify the postures to the appropriate level (go as far as you feel comfortable), there should be no sharp pain, just an opening/stretching sensation. 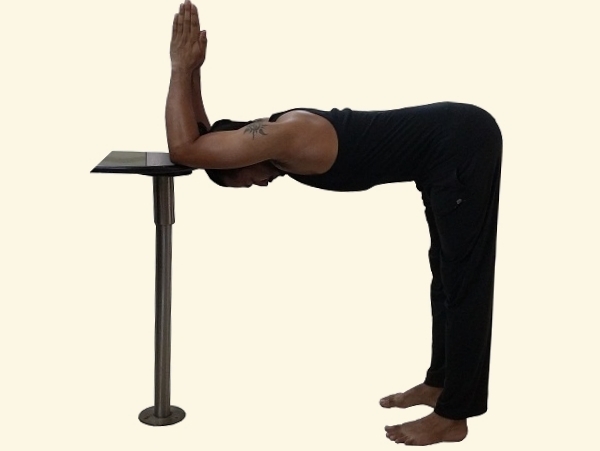 These postures are also useful for improving other yoga postures. 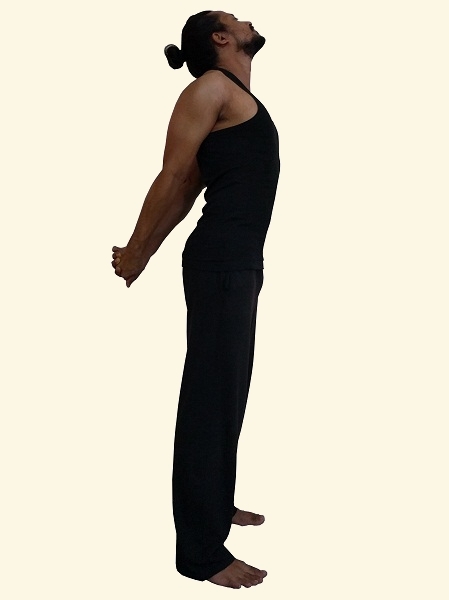 With an open upper body you can bring good energy flow in back bending, taking pressure away from the lower back. Increasing the range of motion for the shoulders will also help you to achieve a straighter handstand, rather than the banana shaped handstand. Nowadays most of our time is spend sitting at a desk. It’s very important to use a chair which supports your body’s alignment and helps maintain a proper posture. There are lots of ergonomic chairs out in the market which can help you to fix your posture of relieve you back, neck and shoulder pain. Want a Yoga Course Manual Made? COPYRIGHT ©Pranayoga. ALL RIGHTS RESERVED.